Do you love to crochet? Do you wish you could get together with other crocheters to socialize, learn and just have fun? Do you know about the Crochet Guild of America? If not, you are in for a real treat! And this month is the perfect time to learn more about CGOA and join during their membership drive at a reduced rate. CGOA was created when a passionate and determined crocheter, Gwen Blakley Kinsler, began searching for like-minded people who wanted to get together to share “everything crochet!” With a few volunteers in place, they launched the first conference in 1994 with 90 crochet enthusiasts in attendance! By the second conference the attendees voted to become an official not-for-profit. The organization is now 24 years old is still going strong. In addition to a fun-packed yearly conference, the organization offers many benefits including free patterns, masters program, a yearly subscription to Crochet! magazine (an Annie’s publication), local chapters, and much more! “The Crochet Guild of America (CGOA) is all about crochet. It is the only national organization dedicated to the craft of crochet with nearly 3,000 members. RECEIVE. 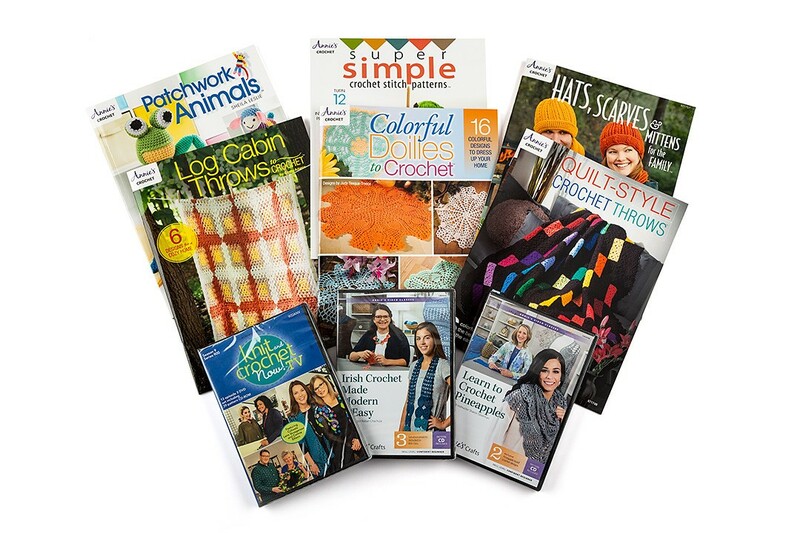 As a member, you’ll receive a subscription to Crochet! Magazine, free patterns, and member discounts. CONNECT. 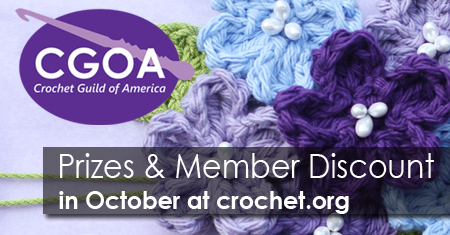 You can connect with crocheters of diverse backgrounds online or in real time at local chapter meetings and the annual conference. LEARN. Learn and demonstrate advanced skills and receive recognition. If you join during the month of October, not only will you get all the benefits of CGOA at a discounted rate, but each week you can enter to win a prize package donated by CGOA sponsors! Enter by October 8 to win the Annie’s prize package worth over $100.00 pictured here. Make sure to visit the CGOA website and take a look around at all this great organization is doing to promote crochet. And plan to join me at the conference in July 2019 in Manchester, New Hampshire! CGOA will be celebrating 25 years and this is one party you don’t want to miss!